Frankie is a 4-day intermediate to advanced intermediate level counted canvas project. 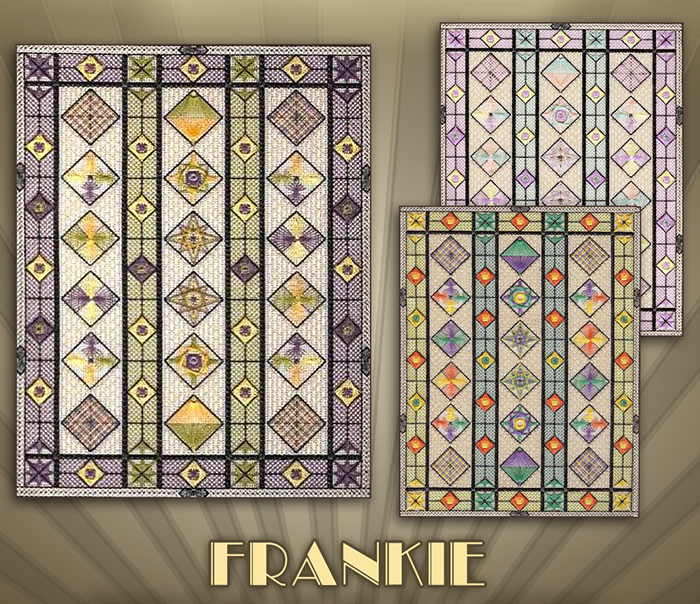 This design is Micbael’s interpretation of a Frank Lloyd Wright-style stained glass window. It features a variety of carefully diagrammed twisty stitches. The finished design size is approximately 8 by 11 inches. The working canvas is 12 by 15 inches. The design is worked on 18-mono eggshell canvas. It is stitched with #12 perle cotton and cotton floss from Finca Prescencia, Rainbow Gallery’s Silk Lamé Braid, Kreinik ribbon and braid, and Sundance beads. Stitches used in the design include: backstitch, a plaited couching pattern, smyrna, wheat sheaf, Walneto, various Jessicas, Amadeus, waffles, Double Fan, Double Fan Doubled, Eight Point Star, Chilly Hollow, and patterned couching. The use of #12 perle cotton gives the overall design a light, open look. All of the colorways have the black, ecru and metallic threads in common.